Treat yourself and your family to the memory-making fun of an inground pool and spa. A new Tequesta swimming pool will make you feel like a kid again. Swimming, splashing and floating in your own backyard pool is nothing short of rejuvenating. Those of us who grew up without a swimming pool swore we’d have one someday. Those of us who grew up with a pool won’t go without one! Whether you’re looking for a way to relax and unwind, improve your home’s value, or just to have unadulterated fun, a home pool and spa will change your life for the better! Owning a pool makes your home an entertainment destination, provides an outdoor activity for the kids, and scales up your Tequesta property’s value significantly. Enjoy the feel of your own private resort this year and for decades to come with a pool and spa from Treasure Pools and Service. Choose a reputable builder that has built a successful swimming pool company based mostly on reputation and satisfied clients. When you select to work with the best Tequesta pool builder, Treasure Pools, you can be sure that your pool and yard makeover project will be completed on time and on budget. Treasure Pools and Services has built a long list of happy clients with an A+ Rating with the Better Business Bureau, as well. 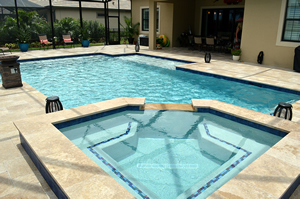 Tequesta homeowners have trusted Treasure Pools to design and build custom new pools and spas for decades. You can count on licensed pool contractor Joseph Palma and partner Craig Cohen to design and build the pool you’ve been dreaming of. Those with existing Tequesta swimming pools can also trust Treasure Pools and Services for top quality pool remodeling and resurfacing, deck and patio construction, as well as landscaping and lighting are also available. If the cost of an inground pool is holding you back, don’t worry! Ask about Treasure Pools’ low-interest financing options or pay-as-you-go payment plans to bring the joy of your own backyard paradise to life. There’s no need to wait for someday…get started on building your Tequesta swimming pool and spa today! Call (561) 793-1550 or 800-281-SWIM (7946) now for a friendly consultation and you can be enjoying your own new pool and spa within weeks.